Signed portrait of 379 Gunner (Gnr) John Henry Osric McMullen, 1 FAB, of Leichhardt, NSW. A horse driver prior to enlistment on 24 August 1914, McMullen embarked from Sydney aboard HMAT Argyllshire (A8) on 18 October 1914. He was wounded in action, suffering severe damage to the spine at Gallipoli in May 1915 and was hospitalised at Mustapha Convalescence Camp. In August 1915 he was and invalided to Bethnal Green Hospital in London, then Number 1 Australian Auxiliary Hospital, Harefield Park, Middlesex. In May 1916, he was discharged as unfit for war service, suffering functional paraplegia. He reenlisted in London in June 1917 under the number 32661and served the remainder of the war with the 14th FAB in France, during which time he was promoted to Lieutenant in April 1918. He returned to Australia in September 1919. 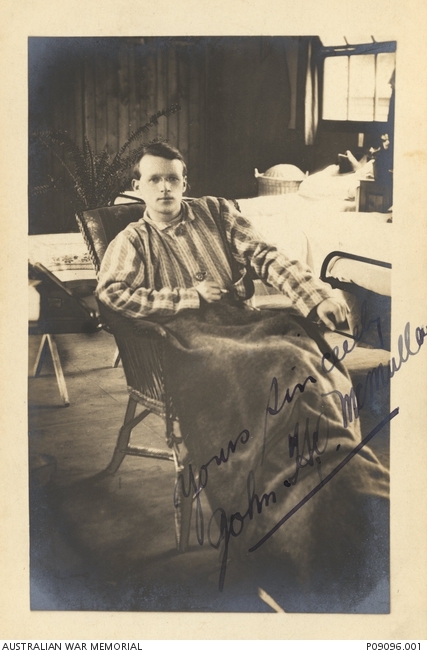 McMullen wrote on the verso of this card “Still alive, still progressing, still at Harefield – will send a pass – Osric”. 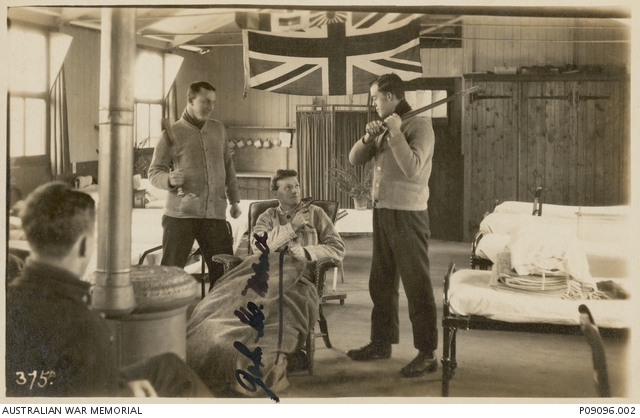 Signed portrait of 379 Gunner (Gnr) John Henry Osric McMullen, 1 FAB, of Leichhardt, NSW with fellow patients in a ward at Number 1 Australian Auxillary Hospital, Harefield Park, Middlesex. A horse driver prior to enlistment on 24 August 1914, McMullen embarked from Sydney aboard HMAT Argyllshire (A8) on 18 October 1914. He was wounded in action, suffering severe damage to the spine at Gallipoli in May 1915 and was hospitalised at Mustapha Convalescence Camp. In August 1915 he was invalided to Bethnal Green Hospital in London, then Harefield. In May 1916, he was discharged as unfit for war service, suffering functional paraplegia. He reenlisted in London in June 1917 under the number 32661and served the remainder of the war with the 14th FAB in France, during which time he was promoted to Lieutenant in April 1918. He returned to Australia in September 1919.